We just received two great new books about food. 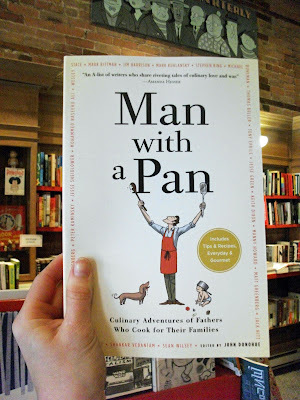 Man with a Pan: Culinary Adventures of Fathers Who Cook for Their Families is an anthology edited by John Donohue of the fun and informative blog, Stay At Stove Dad and the book features writing by famous foodie dads (Mario Batali, Mark Bittman, and Stephen King among them) about their culinary family lives. The book includes over sixty favourite recipes. 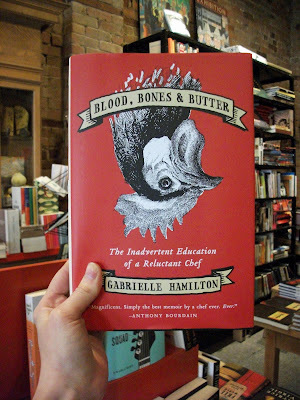 Blood, Bones and Butter: The Inadvertent Education of a Reluctant Chef is a memoir by Gabrielle Hamilton of the acclaimed New York restaurant Prune (which is delicious by the way, that bone marrow!). Hamilton's memoir has been ranking high on the New York Times Hardcover Nonfiction Best Seller list since its release in March. It's supposed to be one of the most exciting kitchen narratives since Anthony Bourdain's Kitchen Confidential (a.k.a. Cooks Gone Wild).